Yes, that viral video of KLM's "lost and found" dog reuniting passengers with their lost phones is adorable. But sadly, it's just an ad campaign. The dog is not a permanent member of KLM's actual lost and found team. A real dog, such as seen in the promofilm that KLM launched on Twitter today is not a part of the Lost & Found team. "The dog is purely used to symbolize the active way in which the team will search for owners and unite them with their lost possessions," a KLM spokesperson Joost Ruempol is quoted as saying in an English translation. The first tip off to Factually was the way that the creative team behind the video was describing its creation on advertising blogs. 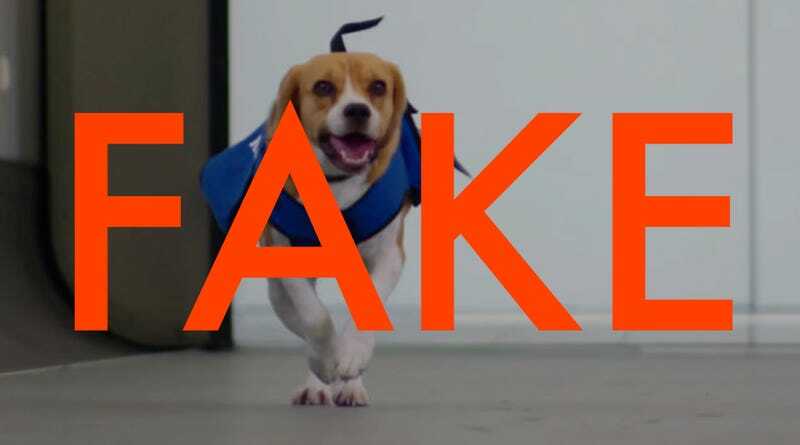 The advertising agency DDB & Tribal reportedly came up with the idea for the dog video after hearing that KLM's real lost and found team successfully tracked down passengers using seat numbers, phone numbers and even social media. The adorable dog element was the advertising agency's creation. "So to illustrate that KLM goes above and beyond for their passengers, we decided to involve a search dog," the advertising men behind the viral video explained to MediaBistro. I reached out to KLM for comment, as well as the creative duo (Alex Herwig and Jeroen Thissen) at DDB & Tribal who produced the video. Herwig replied with a statement that Sherlock was a mascot — a polite way of saying that he's there to just tug at your heart strings. Sherlock is the mascotte of KLM's brand new Lost & Found team. A dedicated team with a mission to return items, found by cabin crew on board or by KLM airport staff, to their legitimate owners - as soon as possible. Very often the Lost & Found team is able to surprise passengers by returning their personal belongings before they have even missed them - like true detectives. Despite the challenge of locating the owner, first results show that over 80% of the found items can now be reunited with their owners. To launch the team, we decided to give them a helpful mascotte, Sherlock the search dog. With the video we wanted to show that KLM goes above and beyond to return lost items to their owners. It's a lovely ad, but it's just that — an ad.